My Experience: Don't Spend A Ton Of Money On HDMI Cables. Some of you may remember that I mentioned trading in some American Express Rewards Points towards a new HDTV and a Blu-Ray player, and I finally have them all hooked up here in the new apartment. And while the cable guy brough an HDMI cable to hook the cable box to the TV, the Blu-Ray player didn’t come with one so I had to buy one for myself. So I went online to look for one and was amazed at how vastly different the prices can be! A 6 foot HDMI cable on Amazon.com can vary from $.27 all the way up to $299…I was absolutely stunned. While some are basic and some are high-speed HDMI cables, I did some research online to discover that most of these cables all work perfectly fine, especially for people like me who probably wouldn’t notice any difference at all in the quality. 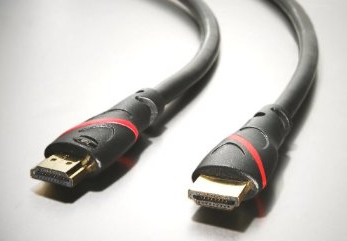 On some HDTV forums it was suggested to at least get a high-speed HDMI cable for Blu-Ray players, so I settled on one that got a ton of positive reviews and only cost $9.99 – this Mediabridge Ultra Series 6ft High Speed HDMI Category 2 Certified cable. I hooked it up and everything works and looks great and I am very happy that I didn’t spend a fortune on a $10 cable! Out of curiosity I stopped by Best Buy this weekend to check out the prices on their HDMI cables – wow. People actually pay those prices? $79 for a cable with the same ratings and length as the one I bought online for $9.99? What a ripoff. I am willing to bet that no one could tell the difference between an image being sent through my $10 cable versus one sent through an $80 one, and I am so glad I did some homework before wasting all that money. The lesson here? Don’t blow your money on overpriced cables for your home audio/video setup. Chances are that unless you are charging admission for others to watch movies at your house, you are just wasting your money that could be better spent elsewhere! Shop With These Geeky Money-Saving Tools. Tips For Improving Your Cash On Hand. I’ve been using monoprice.com for my cables for the last 3 years. It looks like the comparable cable to the one you bought is only $3.56 on monoprice. The cables I have bought from there are better quality than the monster cables you can get in Best Buy (with their 400% or so mark up I can’t believe anyone buys monster). Monoprice is THE place to go for cables! That’s all I have to say. I just had to reiterate the first poster’s comment. Like the others say, http://www.monoprice.com is the place to go, dirt cheap there as well as other wires. +1 for Monoprice. Been using them for years and they are amazing. Especially when it comes to some odd cables or connectors you just can’t find at most big box stores. Monoprice for any cable, not just HDMI. This product seems to be one of the latest ripoff schemes from the retailers. No need to spend all that money–I spent $6 on mine and my picture is great!